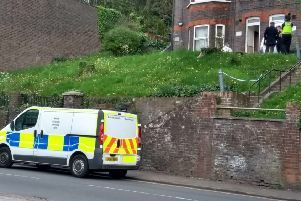 A man was stabbed in the back as he was sitting on a bench at the junction of St Peter’s Road and Dallow Road, Luton, on April 2. He was approached by a group of men and stabbed several times, causing back injuries. The men then left the scene in the direction of Ashburnham Road. Anyone with information is asked to contact DC Foster on 101, text 07786 200 011, or contact Crimestoppers, anonymously, on 0800 555 111.